One of the perks about living out in the country is I have a delightful 20 minute drive into town to enjoy the east Texas countryside and keep abreast of the phenology of the local flora. It was about this time last year right after moving into our new house that I was driving to work familiarizing myself with my new route when a plant sporting a glimmering haze on the side of the road caught my eye. When I actually had a chance to stop, I pulled off and identified it as Eragrostis spectabilis, commonly known as purple love grass. I enjoyed seeing the dew collecting on the panicles and the early morning light imbuing it with an ethereal character that would inevitably evaporate as the day aged. Most sprigs I saw were single, scraggly flowers that looked like the way a young girl might practice putting her hair up for the first time. But, one clump was spectacular! It was full and lush, bigger than a basketball, and hard to miss in the fresh light of dawn. Every day I’d drive past it and admire that shimering plant against a shaggy fencerow. I had to have it. Since I arrived in Texas in July of 2014, I’ve been hunting for short, groundcover species that will perform well in our area. Most plants I’ve tried are imports, but here was a species right down the road just waiting to have its potential realized. Being September, I knew that there was a chance it might not survive as many grasses moved in the fall don’t establish well. But, with love and care and some horticultural knowledge, there was also a good chance it would live. With shovel in car one Saturday morning, I pulled off along the roadside and walked over to meet my new friend that I had been admiring from afar. The spade slid right through the sandy soil, and a few jabs and levers later the Eragrostis was up with a nice rootball still intact. Any guilt I had collecting the wild vanished a few weeks later when the mowing crews came along and sheared the roadsides. Back home, I found a nice spot for the transplant in the catch-all herb bed of our newly formed kitchen garden. There, I could check on it every day and water it as needed. I was thrilled when I saw little discoloration the next few days from it adjusting to being moved. A few blades turned tan and purple, but overall the plant settled in nicely. Even though it had a few bruises and browning after being transplanted from the roadside, this mother plant of Eragrostis has settled in just fine. You can see the speckled haze of flowers hovering above the foliage. I loved going out in the mornings and see my new Poaceae pal wrapped in a crystal veil. The flower color is not as purple/pink as most of the examples I’ve seen in catalogs or online, which made me question it's identity. But, the height is right, it has knobby rhizomes, and the flowers match what I can find in dichotomous key photos. My guess is down south the color is weaker than our northern counterparts as is the case for many other ornamental plants in our sweltering heat. Or, perhaps this southern ecotype sports inflorescences that are a lighter shade of maroon? I tried another strain of Eragrostis spectabilis from further east a few years ago whose flowers were more pink in color, but our little trial of plants died. Perhaps they were in too wet a spot in too wet a summer? Or, maybe it wasn’t locally adapted yet? Not sure, but this one I discovered has performed beautifully. The typical rosy-colored flowers of Eragrostis spectabilis. The clump I found and those that I've propagated have more of a light pink or tawny color in the inflorescence. As September wore on, the panicles started to mature. I collected some seed, and sowed them on a whim. To my amazement, they started germinating within just a few days! No stratification or even dry storage required. For those that need a review from plant propagation, dry storage is the name of the germination delay that some seeds experience to prevent them from germinating too early or on the mother plant. Once the seedlings got some size to them, I took them to school and had a student pot these few up into a couple trays for our school garden beds. To my amazement, the disturbance in the pot caused even more to germinate! It seemed to good to be true. These little sprigs I brought home and planted into beds here at the house. As more of the original plant’s inflorescences began to mature, I collected more seed to become the stock for our plantings on campus. Winter came with the worry of loosing the original clump, but this spring, I was thrilled to see new shoots emerging on the mother plant. Being a C4 grass, it was slow to get going, but when the brunt of summer arrived it erupted into growth. Eventually, I tried my hand at dividing the clump into about 20 propagules, and the majority of these survived. However, divisions do seem to grow a bit slower than those from seed. I was also delighted to discover a few offspring popping up around the mother plant. One even sowed its way into a crack in our pavement. Now, a year has passed. We have hundreds that have been planted around the SFA agriculture building. And, back home a few that I transplanted carpet the ground in a portion of our herb garden. I’ve also planted it as the groundcover layer in the beds on the eastern half of the swale I’ve been building through our kitchen garden (more on that in a later post). What few perennials I plugged around these starts look like ship masts emerging out of a grass fog. 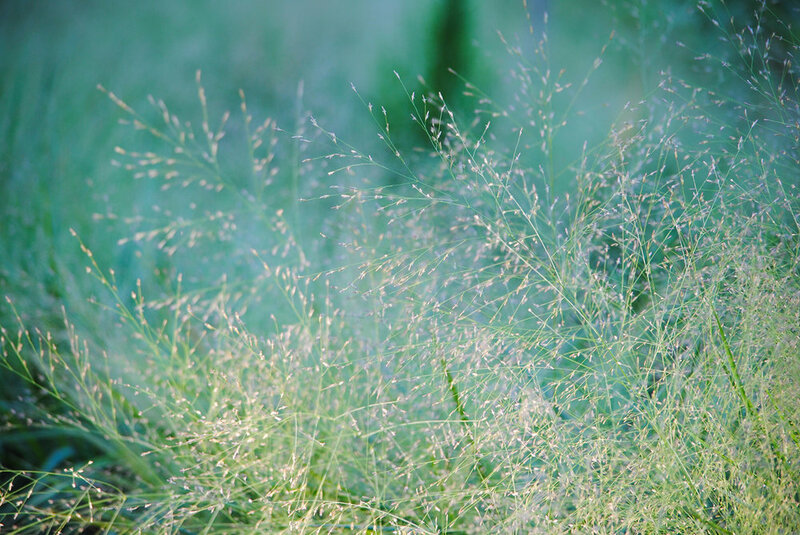 The effect is similar to muhly grass (Muhlenbergia sp. ), but the height is shorter. It would occupy more ground, but I ran out of plants here at the house and have to propagate more. No worries as it appears I’ll have thousands and thousands of seed in a month and Heaven knows how many seedlings next spring. 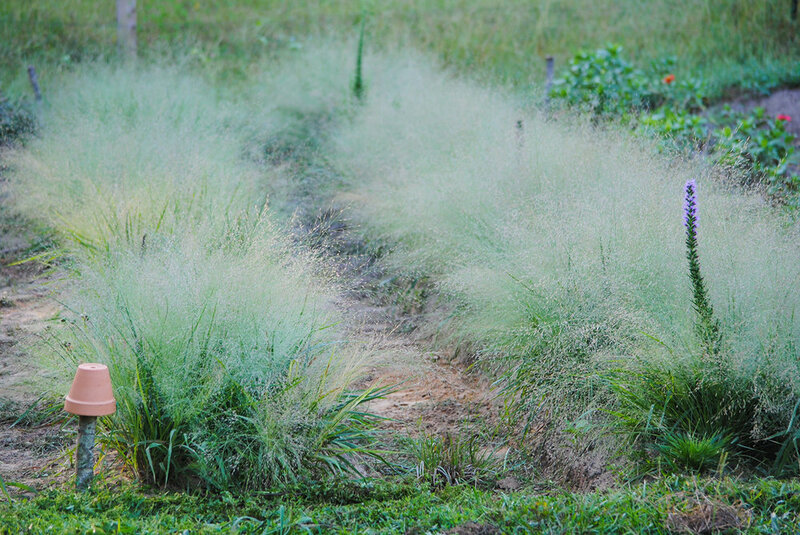 En masse this Eragrostis is spectacular, especially when covered with morning dew. Here, it is planted along the swale that runs through our edible patch. Next year, I expect more perennials to be established and piercing the floriferous fog. I feel proud having moved it—perhaps I could go as far as saying saved it? And, I feel that joy every time I walk past the clumps. In the morning, strolling past the wet panicles reminds me of the plant perspiration Christopher Lloyd wrote about in Exotic Planting for Adventurous Gardeners. And, once the dampness vanishes, the flowers brush against your leg like a friendly feline. 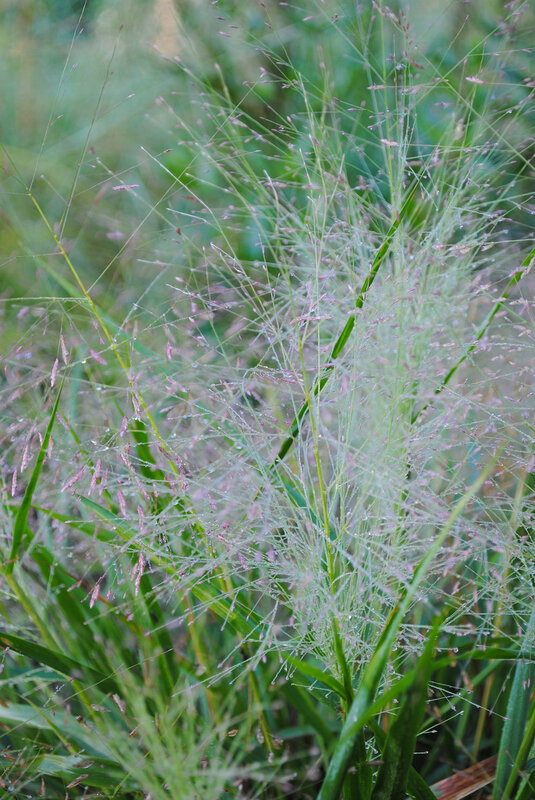 This ecotype of Eragrostis will become a permanent fixture in our prairie plantings here at the house and on campus. And, why not? With a plant named love grass from right down the road that thrives in our climate, what’s not to love?